Three announcements over the past weekend could have a profound effect on how Turkey’s opposition wages next year’s election campaign. First came the announcement on Friday from former presidential candidate Selahattin Demirtaş, who revealed his People’s Democracy Party (HDP) would become the first pro-Kurdish party to contest a Turkish parliamentary election since 2002. For the past two elections, the HDP’s predecessor parties fielded only independent candidates. This was an elaborate attempt to circumvent the 10 percent threshold that parties must secure before they can be represented in Turkey’s parliament. It was also one of the most remarkable examples of local activism seen in Turkey: Kurdish leaders arranged for whole neighbourhoods to vote for designated independent candidates and were astonishingly successful in doing so. There were 22 MPs for pro-Kurdish parties elected in 2007 – enough to form a group in parliament. In 2011, they elected 35 MPs. But Mr Demirtaş’s announcement on Friday marked the end of that strategy. At the next election, he said, the HDP will field candidates in all 81 provinces. He no doubt intends to build on his extremely successful presidential campaign, where he secured 9.76% of the vote. The HDP’s announcement would have heaped pressure on the main opposition CHP, its rival on the left of the political spectrum, were it not for the second announcement of the weekend. YOU PROPOSE AN [HDP/CHP] ALLIANCE? The CHP leader Kemal Kılıçdaroğlu chose a visit to the mainly Kurdish city of Diyarbakır to let it be known that his party was not discussing an electoral alliance with the HDP but added: “even 24 hours is a long time in politics”. 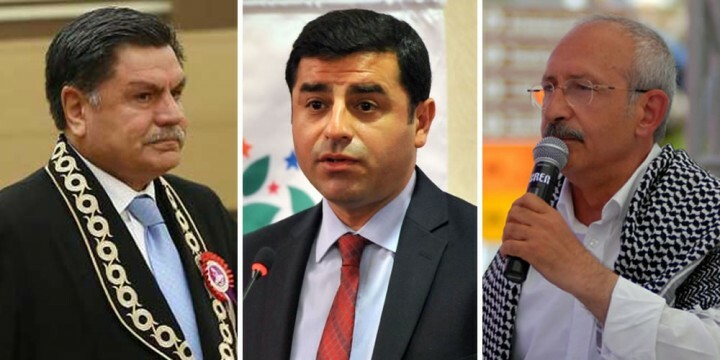 A pact between the two parties of the left would not simply guarantee HDP members in parliament for a third successive term; it would also turn the CHP into a credible alternative for solving the Kurdish peace process. There is precedent to a pact: Kurdish MPs first entered parliament in 1991 after jointly contesting the election with the SHP, a predecessor to the modern CHP. But there is plenty of potential for strife, particularly among those ulusalcı MPs who didn’t follow Emine Ülker Tarhan to her new Anatolia Party. But those ulusalcıs might be emboldened by the third development of the weekend, courtesy of Haberturk columnist Muharrem Sarıkaya, who revealed Turkey’s top court is considering a request to abolish the 10% election threshold entirely. Mr Sarıkaya’s column draws on a brief conversation he had with Haşim Kılıç, chairman of the Constitutional Court, where he confirms the court intends to deliver a ruling on the request in “two to three weeks’ time”. The ruling would come into effect immediately, Mr Kılıç is quoted as saying, and would apply to next year’s general election – despite a clause in the constitution that says any change to electoral law will not affect an election in the following twelve months. Any speculation on the outcome is just that – speculation. It is remarkably difficult to predict Constitutional Court decisions: it is one of the few resilient institutions left in the country, and it has wrong-footed soothsayers in the past. What is certain is that a decision to abolish the threshold overnight would be the most profound change to Turkish electoral law in a generation. It would have implications for everyone because the government would not have enough time to reverse it before the election. That would mean a tiny party could elect an MP with as few as 80,000 votes – if, for example, they run and win the tiny province of Bayburt. Mr Demirtaş could shun an alliance with the CHP and establish his party as a new force on the Turkish left wing. Devlet Bahçeli’s nationalist MHP would lose its single attraction – its ability to cross the 10 percent threshold. This wouldn’t be mere turbulence – Turkish politics would be in uproar. I see big monetizing potential on your page.